An impressive number of impressive people have been working since 2008 to create a county-wide transit system for Washtenaw County. We’ve been following this process for nearly as long. (See the Transportation Page for a list of posts.) Now it appears that the process is almost complete. Articles of Incorporation for the Washtenaw Ride were filed on October 3, 2012. This was supposed to launch a 30-day period in which units of government could choose to opt out of the new authority’s district. They could simply wait the time out if they did not wish to decline. The process got a lot more confused suddenly, as the Ann Arbor Chronicle has admirably detailed. (See County Likely to Send Out Transit Notice and Positions Open: New Transit Authority Board .) As those articles explain, the 30-day window has been stretched somewhat. But most Washtenaw County political units didn’t wait till the deadline. They have moved with alacrity to opt out of the new authority. The map to the right shows that almost all townships in the county have opted out. Note that the City of Ann Arbor and City of Ypsilanti are presumed to have opted to stay in, since they are signatories to the 4-party agreement. (Technically, they could still choose to opt out.) The City of Saline and Ypsilanti Township have passed measures explicitly stating that they wish to remain in the authority. The City of Chelsea and Pittsfield Township are shown as “pending” because they have resolutions on a future agenda to opt out. The sources for this information vary from news reports to reports from persons who attended meetings to minutes and agendas from relevant units. The status of several townships is still not known. Agendas and minutes for Lyndon, Freedom, Lodi and Scio Township have been difficult to track down, and there have been no news reports. It seems extremely unlikely that Freedom, Lodi, and Lyndon townships will participate, since these rural townships would not benefit directly from most transit programs. Status of Manchester Village and Dexter Village is also to be determined. Milan’s city council expressed interest in a “whole city” participation (including the Monroe County portion of the city) back in July 2012, but also reserved the possibility that they might opt out. The loss of Pittsfield Township must be felt severely by the proponents of a larger authority. Pittsfield had the highest taxable valuation in the county, after the City of Ann Arbor, in 2011. The next highest was Scio Township. Scio’s status will be of intense interest in evaluating the possible success of this venture. This post will be updated. See our post from January 2012, How Much County in Washtenaw County-wide Transit, for an earlier speculation and discussion of participation. Revised map showing opt-outs as of October 22, 2012. Scio Township and Dexter Village have not yet acted. UPDATE: Calls to township and village clerks indicate that Lyndon, Lima, and Freedom Townships have also opted out. (A list is also provided today in a comment on the Chronicle’s coverage of the October 18 AATA board meeting.) Manchester Village has also opted out, per the village clerk. Scio Township and the Village of Dexter have the matter on agendas for this week, with no indication of which direction the decision is going. SECOND UPDATE: Benjamin Swayze, the City Administrator of Milan, said that the matter is coming before the Milan City Council on October 29. THIRD UPDATE: Ypsilanti Township voted tonight (Oct. 22) to opt in. We had already shown their participation based on their packet resolution. 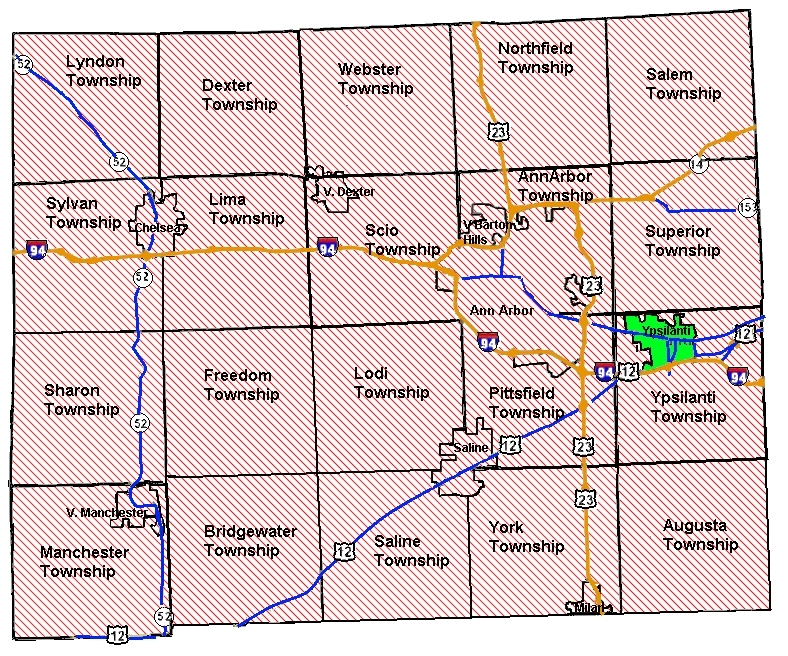 Updated map showing the opt-out by Scio Township on October 23. FOURTH UPDATE: Scio Township voted tonight (Oct. 23) to opt out. They left Dexter Village to decide its own fate. FIFTH UPDATE: According to the Dexter Patch, the Village of Dexter trustees postponed their decision as to whether to join the authority on October 22. The report indicates that trustees wish to see whether Scio and Pittsfield Townships withdraw, since their high taxable valuation is needed to keep the cost to taxpayers across the authority near the estimated 0.58 mills. SIXTH UPDATE: According to their City Clerk, the Chelsea City Council voted on October 23 to opt out of the transit authority. Updated map showing Chelsea and Pittsfield with decisions to withdraw from county-wide authority (“Washtenaw Ride”). SEVENTH UPDATE: According to the Ann Arbor Chronicle, Pittsfield Township voted tonight (October 24) to opt out of the county transit authority. EIGHTH UPDATE: The City of Milan voted to opt out on October 29, as reported by the commenter below. According to the Dexter Leader, the Dexter Village Council voted on the 29th to postpone the decision until November. AnnArbor.com belatedly reported on the community opt-outs and on the Milan vote. NINTH UPDATE: In light of the City of Ann Arbor pulling out on November 8, (Ann Arbor Chronicle account) Dexter Village is regrouping, and voted on November 12 to purchase more service from WAVE. According to the Dexter Leader, they also have meetings scheduled with AATA officials. With other opt-outs, only the city of Ypsilanti remains. TENTH UPDATE: The Saline City Council voted unanimously on November 19 to rescind their earlier affirmative opt-in, and to withdraw from the Washtenaw Ride. Dexter Village voted to opt out on November 26, as did Ypsilanti Township. NOTE: Ongoing coverage of this subject has now been provided in a more recent post, Regional Transit in Ann Arbor and Beyond: A Matter of Governance II. All posts on this subject can be found on the Transportation Page. This entry was posted on October 21, 2012 at 4:35 pm and is filed under civic finance, Transportation. You can subscribe via RSS 2.0 feed to this post's comments. You can comment below, or link to this permanent URL from your own site. Thanks for the update. The map makes clear that the “county-wide” transit system will not be county-wide. After all the time and money spent on planning this, it would seem that the transit planners failed to consult with the affected communities to find out whether anyone else was interested in going forward with the plan. Epic fail. The City of Milan tabled it at the Oct 15 meeting. AATA officials could not provide answers to questions on time frame for implementation, taxation, schedules, etc. It will be revisited on Oct 29, as mentioned. Thanks, yes, Mr. Swayze indicated that. The fact is that they (AATA) are in no position to guarantee a specific timeline for fixed route service right now. I’m not surprised that it was unsatisfactory. Vivienne, this is SUPERB reporting. Thank you sooooooo much for taking the time to get the facts and show that this regional transit proposal is a farce. Thanks. As you well know, sometimes it is just legwork. What fraction of people are in each category? Sorry, don’t understand the question. Could you restate? Vivienne, does it appear that Pittsfield will opt out? Curiously, the U196 rep from Pittsfield has been a strong supporter second only to the Mayor of Ypsilanti with this plan. Secondly, given the opt outs and AATA’s apparent “no only means maybe” attitude; when will AATA abandon ship or will they? I was shocked by this too, since Mandy Grewal has been a firm supporter of the regional transit concept. What I’ve heard informally is that Pittsfield was requesting a level of service that AATA was not able to promise. Your second question – more thought and more comment than this brief reply can cover. There are several ways the corpse can be buried without a millage campaign (which itself would be doomed). One way is for the AA City Council not to approve Mayor Hieftje’s appointments to the new Act 196 Transit Authority. Another way is for the board of this new transit authority never to meet. A third way is for the AATA to admit failure and pass a resolution stopping all work on its project. I personally do not favor a tactic such as having Council block appointments. I hope that all parties can move to a cleaner, more definitive resolution. CM Kunselman has announced that he will bring a resolution to opt out to the November 19 council meeting. If successful, that would negate the effort entirely, since Ann Arbor’s assets are necessary to make the authority operate, and since the 4-party agreement requires a majority of Ann Arbor voters to approve the millage ballot item, which would be impossible if Ann Arbor had opted out. The quickest way to end this folly is for the Ann Arbor City Council to pass a resolution to opt out of the “county-wide” authority and to refuse to transfer our millage and assets to the new authority. Without our 2 mills of taxes and without our buses and buildings, the new authority would cease to exist long before we incur the expense of a new millage election. I agree that any attempt to pass a new millage for the greatly reduced service area of these opt-in communities would fail. The expense of holding a special election where the millage is sure to fail is the best reason to pull the plug on this idea now. Vivienne, Thank you for your excellent reporting! Kudos. Milan City Council opted out with a 4-3 vote. Thanks! I appreciate the news update.